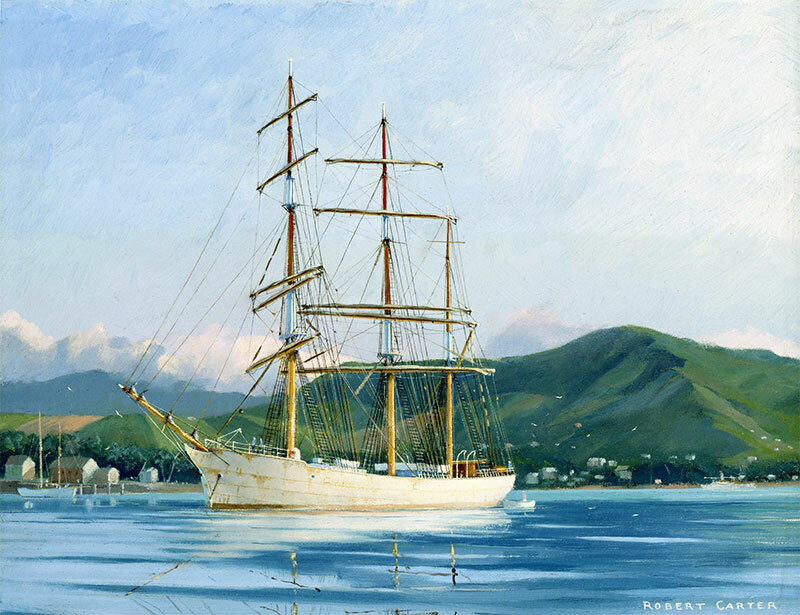 Reminiscences by George Haggstrom and Bertil Bengstrom (seamen in the Finnish barque Favell) of their voyage in 1926 to the islands of Mauritius and Reunion in the Indian Ocean, inspired this painting. She is shown here peacefully at anchor in a setting often dreamed about by sailors on the Cape Horn run. Early in the twentieth century, an important trade in sugar developed with these islands, backed by a demand for coal to fuel the sugar mills plus the general cargoes of essential items needed by this isolated society. Favell was built on spec by Charles Hill & Sons at Bristol in 1895, the last square-rigged vessel to emerge from that port. The decision to build such a vessel, without a definite order, must have caused shareholders some concern, especially when a buyer was not immediately forthcoming. However, the company was as much at home operating ships as building them and they ran their new ship for several years. Named after Charles Hill’s daughter, Favell, under a glass-roofed shed. Launched bow first, she was unique in that she was rigged with single topgallants, when they had been superseded by double topgallants many years before. Her name remained unchanged through four changes of ownership. She tramped around until 1910, when she was bought by Finska Skolskepps Rederiet (Finnish Schoolships Company), a subsidiary of the Finnish Steamship Line. Favell continued in trade, loading grain in Spencer Gulf, South Australia, each year until 1934 when she was broken up. 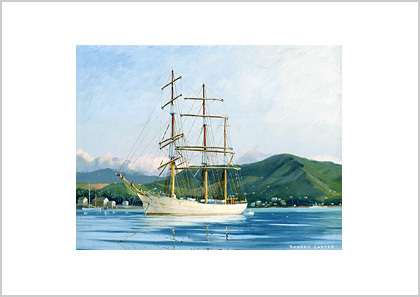 Reminiscences by George Haggstrom and Bertil Bengstrom, seamen in the Finnish barque Favell, of their voyage in 1926 to the islands of Mauritius and Reunion in the Indian Ocean inspired this painting. She is shown here peacefully at anchor in a setting often dreamed about by sailors on the Cape Horn run.